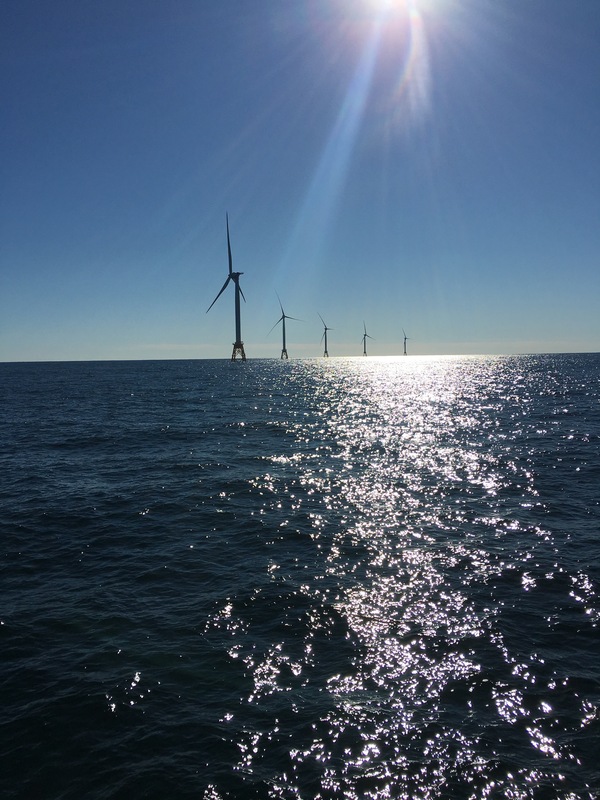 These five turbines sit 3 1/2 miles off the coast of Block Island, RI. 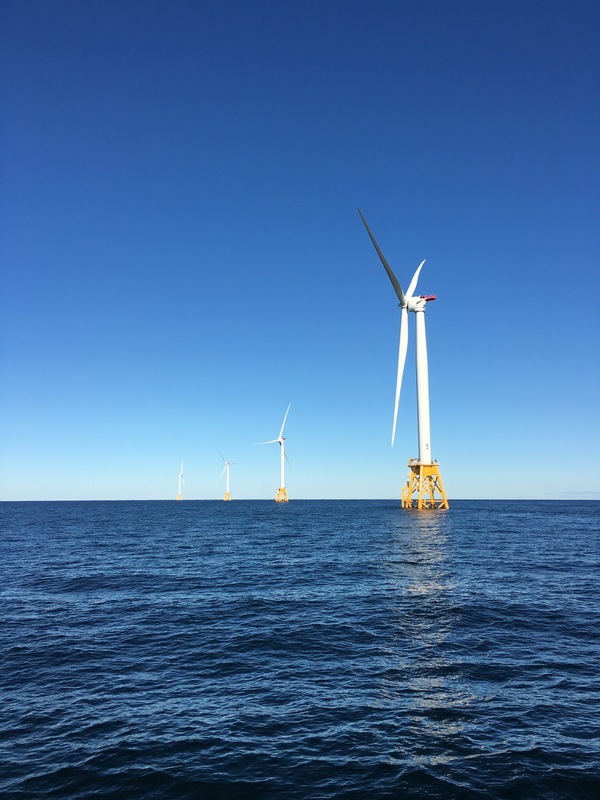 Deepwater 1 is the first offshore wind farm in the United States, and a very big deal for “Little Rhody.” You can see the turbines from the beaches of the south coast, but recently, I was invited by Rhode Island Sea Grant to see the wind farm from the water. 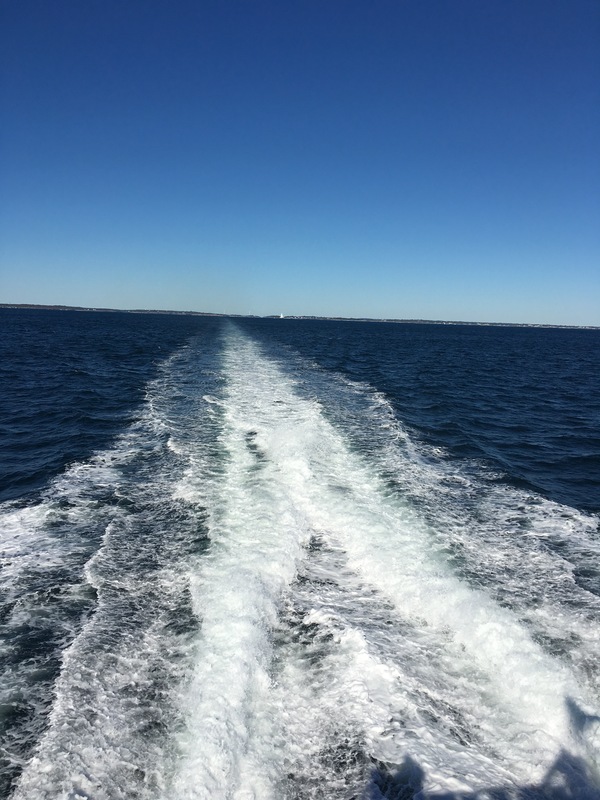 We travelled to the wind farm on a high speed ferry, which left from Newport. The trip took less than an hour. At one point, the captain had to stop the vessel to allow a large pod of Atlantic white-sided dolphins to swim past. Rather than swimming by, they decided to linger for a while, coming right up to the boat to check us out. It was an unexpected and delightful bonus. 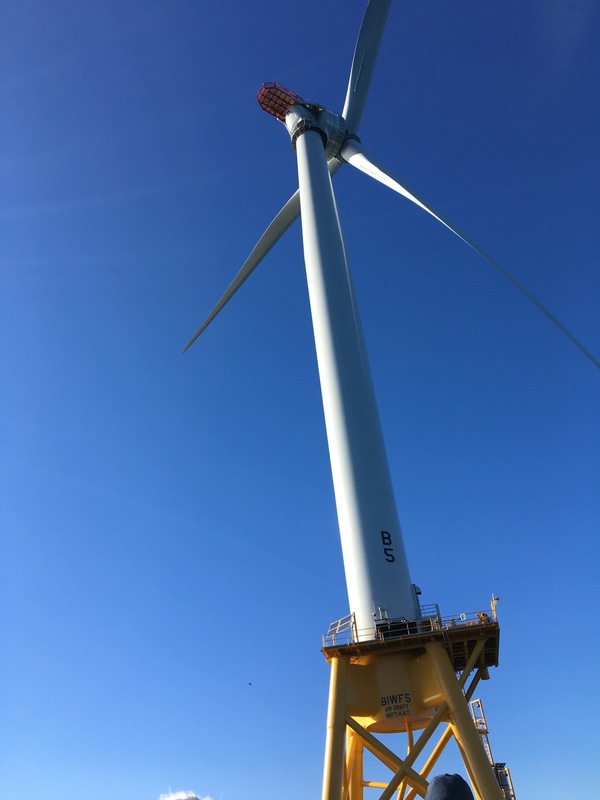 When we reached the turbines, the platforms and towers seemed immense from the water, and they are: 684 feet tall with blades that are 240 feet long. The project cost $300 million to build, and the turbines are expected to begin producing power in November. Here’s one of the turbines. My neck got sore looking up at them. 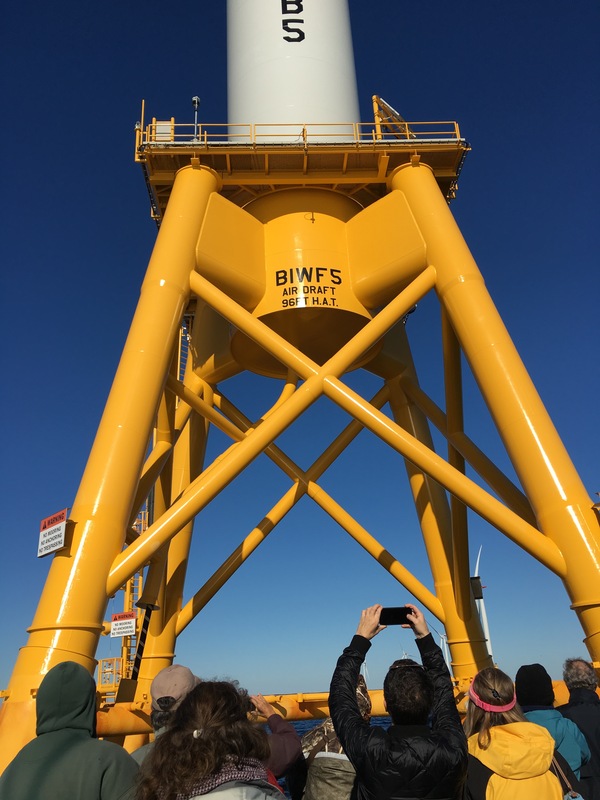 This installation will supply all of Block Island’s electricity, replacing a polluting diesel generator. Power will be sent to the mainland through an underground cable which has been buried 10-feet under the sea bed. Whether or not you support wind power – and some people don’t – seeing the turbines up close is a memorable experience. All I know is that during the siting process, the developers consulted extensively with ornithologists, including one I know of from the University of Rhode Island. The scientists were asked to determine whether the proposed site was in a flyway or migratory pathway. I do not recall if the site was moved because of concerns for birds, but it was moved when fishing charter boat captains said it would affect the fish. Also, these turbines will not spin nearly as fast as the ones at the Altamonte wind farm in California where so many birds have been killed. As for migrating bats, of which RI has several species, I am not sure if they would be affected by the new wind farm. I wish I had more information for you, but that’s all I have right now. Wow. They look quite majestic out there. You cannot imagine how immense they are. It’ll be interesting to see how much noise they make when they are spinning. Your photos and prose bring it home to me. Yikes, I didn’t know that you can see them from South County beaches, not liking that but I can’t dismiss the value of its energy generation. I’m cautiously positive about this clean energy source. I am actually more comfortable with solar power. I worry about the effects of wind turbines on birds, and especially, bats. Regarding wind turbines’ impact on nature, have enough studies been done? My impression is that there haven’t been. I had wondered about impact on birds and marine life but hadn’t thought of bats. Thanks for reminding. So perhaps I’m returning to my former position of not being so positive. Live and learn. I’m not sure either. And the effects of driving the pilings into the ocean floor is very damaging to marine life. They monitor for whales, but fish are another matter.